In Dublin, just as in all of Europe, the spires and steeples of beautiful church buildings turn your eyes upward as you walk around each corner of the city. I noticed in the advertising about tourism in Dublin that one particularly beautiful building adorned the ads for The Church. John Wesley delivered his first sermon in Ireland here in 1747 when it was known as St. Mary’s Church of Ireland. 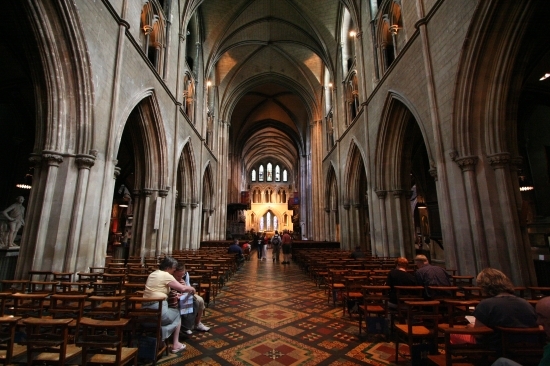 George Handel used its organ to practice as he prepared for the first public performance in Ireland of his Messiah. Other notables attended and a few are buried within its walls—as is the case with many churches in Europe. Welcome to The Church. The Church is the ‘local’ of choice for native Dubliners and welcomes approx 700,000 visitors annually from all over the world who come to experience the culture, atmosphere and friendly service at The Church. So begins the description on its website—well, not exactly. I deleted a few words in the opening sentence, so let me put them back in now. Welcome to The Church, we are Dublin’s most unique bar and restaurant. Now that’s disappointing, isn’t it! Just as disappointing to me is to note their website http://www.thechurch.ie . Was there no Christian church in all of Ireland that claimed this site?? Today . . . today the Irish are nominally Christian (84%), but the churches are empty while the bars are full! Christianity in Ireland dates back to the very earliest mission efforts of the earliest Christians, perhaps as early as the second century, but surely by the third. The national treasure of Ireland is the Book of Kells, an illuminated copy of the four gospels, created sometime around 800 AD. And then there is St. Patrick and St. Columba, from the 5th and 6th centuries respectively—great heroes of faith in Ireland. Many stories of early Irish missionaries, then later Irish Christian scholars, fill the pages of western church history. We worshiped with a very faithful remnant in Dublin on Sunday, and I’m sure there were other very faithful Christians meeting around the city. The variety of nationalities represented jumped out at us. Out of 40 people in this service, at least half were from non-western countries: Liberia, South Africa, Ghana, Malaysia—probably others whom I did not meet. Fortunately, the pages of western church history do not contain the whole story of the Way—just as the story of the Jerusalem church was/ not the whole story of the Way even in the first century. I’ve been thinking of how much trouble the Jerusalem-mostly-Jewish Christians had accepting the fact that the gospel was not just going to a few Gentiles, but was spreading throughout the Gentile world. We call them the “judaizers,” but mostly they were Christians who were trying to imprison the Message into the Jewish context from which it started. As late as the end of the book of Acts, roughly thirty years after the day of Pentecost, James, the brother of the Lord and an apostle/elder in the Jerusalem church, pleads with Paul to accommodate the Jewish Christians who needed to see that he had not forsaken the Law and that he was not introducing Gentile elements into temple worship! As the Jews saw their place in the world slipping away from them—it’s only another decade until Jerusalem and the temple are completely destroyed and the Jews scattered among the nations for 20 centuries—they held on even more tightly to their own traditions—even the Christian Jews apparently. Is it possible that the Christianity of the western world with all its centuries of architecture and tradition has grown so stale that God is moving on with His plan? Many have reported the shift in Christianity’s center to Africa and the southern hemisphere. The rapid growth of the kingdom in China has great potential for changing the outward appearance of Christianity in a world where one out of every four persons alive is Chinese. We feel like we are in a battle for the very life of the church in America. We see churches closing around us now and we are afraid they will all become bars and restaurants like in Europe. Of course, we, as do the European Christians, must continue to be faithful, to bear witness, to be salt and light, but we should not be afraid for God’s church. And we should be wide open to receiving the nations into the heart of our fellowship—because they are in God’s heart!